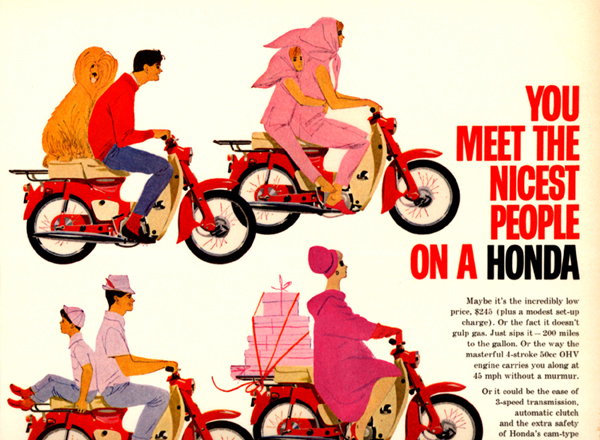 Feature - "You Meet the Nicest People..."
In 1962, advertising exec Robert Emmenegger helped make Honda a household name and riding motorcycles acceptable. Today, he lives in the Ozarks... in Fayetteville, Ark. Motorcycling of the post-war era through most of the 1950s seemed to be the domain of a noir sub-culture of serious enthusiasts and outlaw bikers – at least in the minds of my parent’s generation. Motorcycles of the day were not se rious transportation. They were oil-leaking, maintenance intensive rides and their popularity was limited. With the 1947 “riot” in Hollister, California and the formation of the Hells Angels motorcycle club fresh in the minds of the public, and re-enforced by the 1953 Marlon Brando movie “The Wild One”, it’s no wonder they, and most of America, had an aversion to bikes and all things related to motorcycling. But in 1959, a little Japanese company named Honda decided to take on the American motorcycle market, complete with all its accompanying negative attitude toward motorcycles. The first two years saw modest success. The step-through Cub 50 was sold in sporting goods stores and a small cadre of dealers. As the Hondas caught on, dealers sprouted like dandelions after a spring shower. 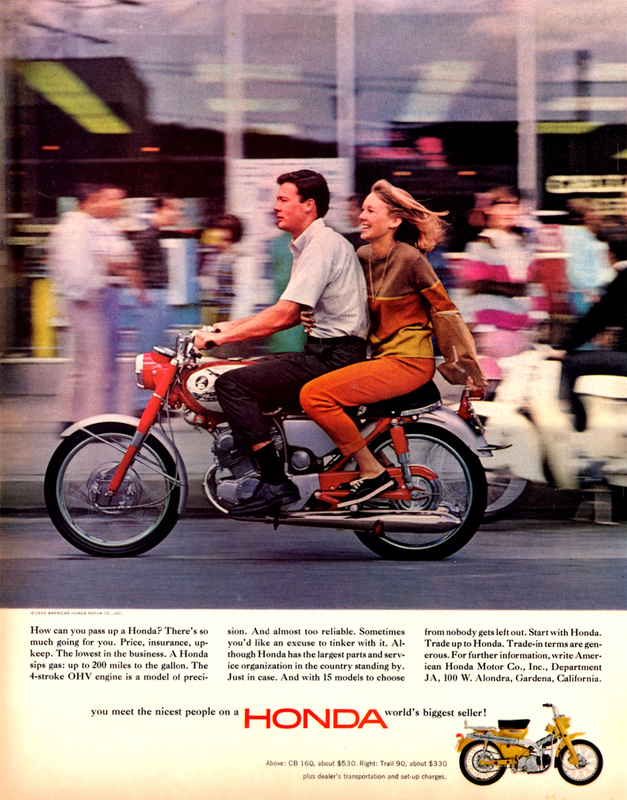 Small ads touting the “Nifty, thrifty, Honda 50” bikes were seen in Popular Mechanics and other such magazines. But just making dependable, easy-to-ride, attractive machines wasn’t enough to make the impact Honda wanted. To take this newcomer on the American motorcycling scene into a place of prominence, Honda needed to make a bold move to sell motorcycles to those who weren’t riders or bikers. To that end, in 1962 American Honda hired the Gray Advertising Agency to help introduce their machines to this non-traditional bike audience. To head up the team to work on the fledgling Honda account, Gray Advertising hired a talented young creative director for the account. Robert Emmenegger had the film and television commercial experience, as well as the extensive musical expertise, to develop a campaign to accomplish their goals. And he had a new approach – that motorcycling could appeal to students and other young adults who would enjoy the economy, freedom and fun two wheels offered. To Emmenegger, Honda was just another account, just like Gallo Wine, Matel Toys, and a dozen others. 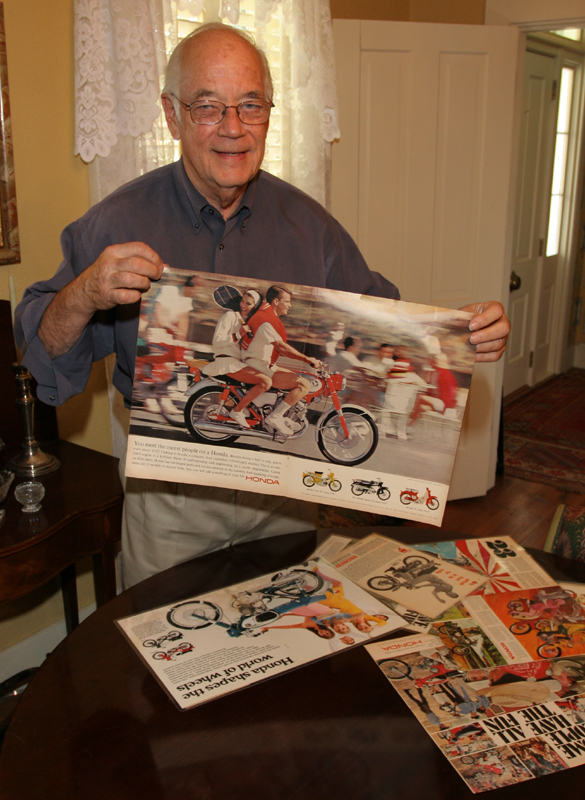 He had a keen sense of how to create appealing campaigns and turned that talent toward his new two-wheeled client. From his imagination and that of his team came the iconic phrase “You meet the nicest people on a Honda.” The rest, as they say, is marketing legend. While Emmenegger’s responsibility was to oversee all media advertising for Honda, but his specialty was television commercials. He often wrote the music and lyrics for them. One catchy commercial tunes told the viewer to “Get’cherself a Honda, it’s a four stroke...” Looking back, he sees some of the commercials as a little overblown. 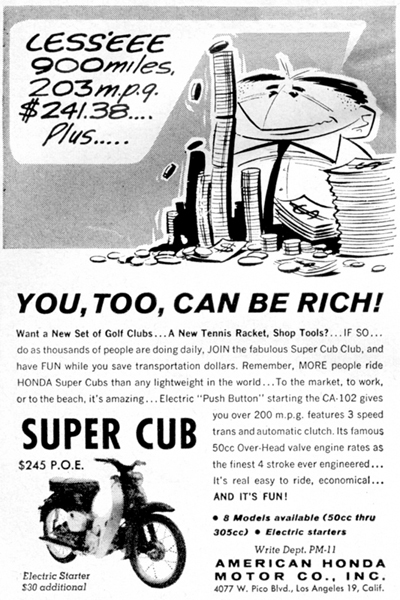 “One time we had the actor William Conrad, with his deep bass voice, touting the virtues of the mighty Honda 50 Cub,” he recalls, showing a dvd of the commercial. 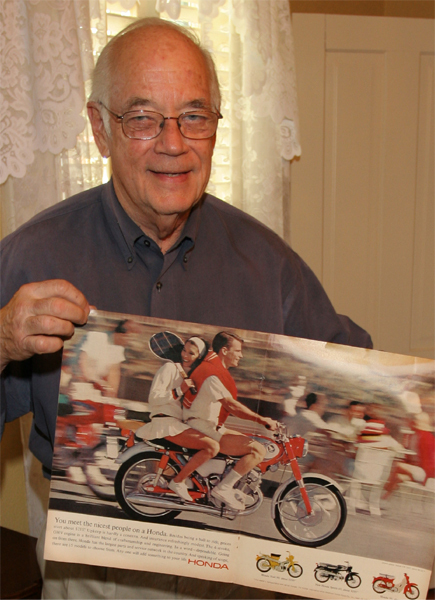 A favorite was the commercial where motorcycle legend Malcolm Smith (click here to view) played the part of a parish pastor who received a motorcycle as a gift from his congregation. “They were showing him how to start it and get it going and such,” Emmenegger explains. “Then he takes off, rides it around a bit [pulling wheelies] and then rides off across the top of the water on a lake, – like Jesus walking on the water. We drained a lake, built a platform across it, and let the water fill back up.” It was a neat commercial Emmenegger says. Asked if he ever gave a thought to the fact that he, through his work for Honda, was partially responsible for the popularity of motorcycle riding today, he just nodded his head no and said, “at the time, it was just another client.” But the distinguished graying gentleman behind a warm smile acknowledges that “now that you mention it, I may have helped a little.” Through his creative work on the Honda campaign, Emmenegger helped take the handlebars of motorcycle riding out of the grip of outlaw bikers and put them firmly in the hands of mom and dad, and brother and sis... maybe even a few grandmothers. Fifteen years ago Emmenegger abandoned the West Coast and moved to Ozarks fly-over country... Fayetteville, Arkansas. As I was visiting with Emmemegger, literally tens-of-thousands of motorcycles were passing by on the highway 100 yards in front of his beautiful tree-shaded home, on their way to Fayetteville’s Bikes, Blues and Barbecue rally. “This is at least partially your doing,” I said motioning at the passing parade of bikes. He just smiled and shrugged his shoulders as he walked with me across his driveway. I got on my trusty old Honda Pacific Coast and bid goodbye to a genuine unsung legend. One of my favorite things to do when out either on a ride or out with my wife is to stop at flea markets and antique shops and find stacks of LIFE magazines from the 1960s. I plop myself down, get comfortable and leaf through the pile of old periodicals looking the the motorcycle ads... mostly Honda, but I have also found some great Yamaha, Suzuki, and Kawi ads. They copied Honda when they saw the success of the motorcycle pioneer in making inroads with the American public. I cut the ads out and laminate or frame them and add them to my collection. I hope you have enjoyed this bit of motorcycling history.